It has been a while since I updated the PWP standings. Two and a half months, to be exact. I started to calculate the rankings for the new season immediatly after n00bcon 7, but the same issue I've been thinking about for the last two years hit me again. Once we started having tournaments with over 16 players, the rating system would get very top heavy and fairly skewed. I looked at a few options on how we could do it instead. After checking some different ways local Magic Leagues in other formats calculates points, I eventually reached the conclusion that the simplest way to do it is to use something similar to Wizards own Planeswalker points system. The new system is described in some detail at the PWP-page. But I digress. Creating expansions to The Gathering wasn't really the plan. 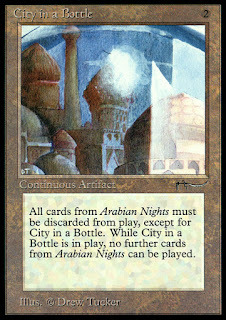 The idea was to let the 10 million cards from Magic: The Gathering fill the demand for the foreseeable months, and then phase them out for Magic: Ice Age about a year later. Instead, the first edition of Gathering sold out in weeks. To saturate the demand a second edition, Unlimited, was printed. It was soon clear that this wasn't enough. The players demanded new cards to fill the void before Ice Age would hit the shelves. The phone wakes me up. I stumble to answer it, barley supporting my movements on my newly sprained ankle. A scent of decadence in the room. The physical pain in my foot is second to the psychological embarrassment. Maybe I'm not 20 anymore. Maybe I should not spend 14 hours drinking and dancing in the streets. Maybe two or three punk bands are enough for one evening, and maybe I shouldn't be drinking Jack from the bottle. After I trip down a stair and clearly sprain my foot, maybe I should listen to my girlfriend when she suggests taking a cab home rather than continue running down the streets of Oslo. Sometimes, I'm not a very bright man. It's Kungmarkus on the phone. He's been travelling from Arvika with JohanGuld and Artelas, and he asks where he can park his car. 13:40. Yeah, it's 13:40. The tournament is scheduled to start in twenty minutes, and I'm a Scathe Zombie away from home. 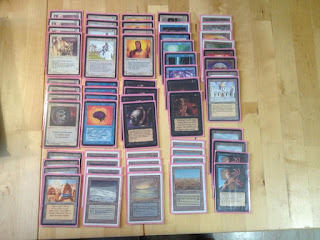 This Sunday my roommate Hardy and I will host the first non-proxy 93/94 tournament in Oslo. It will take place in our apartment, aka the Joy Pad. We decided on the time last Sunday, and are hoping for around 6-8 competitors, given our meticulous planning and early heads up. The tournament starts at 14:00, Sunday the 7th. There is no tournament fee, but betting is encouraged and there will be some kind of price for winning. Bring beer. So what beer you ask? Personally I recommend to match the beer with the deck. You e.g. don't want to be binging Red Stripe playing Stasis, as it would cause problems with bathroom breaks and rounds going to time. If you are in Oslo and want to try the format, I'll be happy to lend out the TaxEdge or Monogreen. Might also be a Trick Deck up for grabs. 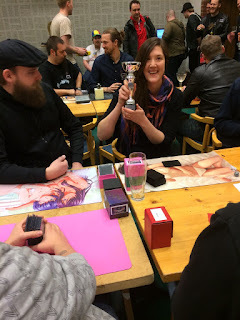 I'll post some pics and a short tournament report here after the event.